I believe ‘Side by Side’ is the best movie to have come out of the year 2012. It gets 5 out 5 stars for helping us understand and appreciate movies and the craft of making movies. This movie/documentary, which is based on an interview format, is produced, moderated and narrated by Keanu Reeves. Astonished? Read my review to find out why I made this selection. It takes you on a journey of discovery, giving you a backstage pass to how movies are made. It gives an overview of processes which were used to make a movie over the years and the current technological achievements and improvements in the industry. Most importantly, the people who are being interviewed, are some of the most respected actors, directors and producers, e.g. Martin Scorsese, Danny Boyle, The Wachowskis, Christopher Nolan, George Lucas and James Cameron to name a few. Side by Side Official Trailer (2012) from Company Films on Vimeo. Rotten Tomatoes’s Tomato Meter gives it a 93% rating. IMDb gives it a 7.7 score. I agree with these ratings/scores. This is one movie you MUST watch. Even if you have very little time left in your life here on planet Earth, you absolutely need to take some time out of your schedule and watch this movie. Yes. It is that good. I must admit, I am biased towards documentary movies. But, wait till you watch the movie. It talks about the different roles of people involved in the development of a movie. It shows the dilemmas, challenges, fears and conquests from some of the amazing pioneers of movies over the years. This movie should be a definite part of every movie/technology buff’s collection. Now the role of Keanu Reeves in the movie. He’s the producer, the interviewer and the narrator. His voice during narration seems a little different than the usual professional British/American narrating voices we are used to, while watching documentaries. A simple trick, which I used to overcome this, is to think that Neo from The Matrix is narrating. Everything falls into place after that trick. With movies like Josh, Zinda Bhaag and Chambaili giving hope to some about the ‘revival’ of Pakistani cinema, I felt the need to watch some of the indie movies made in Pakistan, in the past. So my first attempt was to watch a movie that was on my list for a long time but I didn’t have the courage (read stomach) to watch it. It was Zibahkhana. 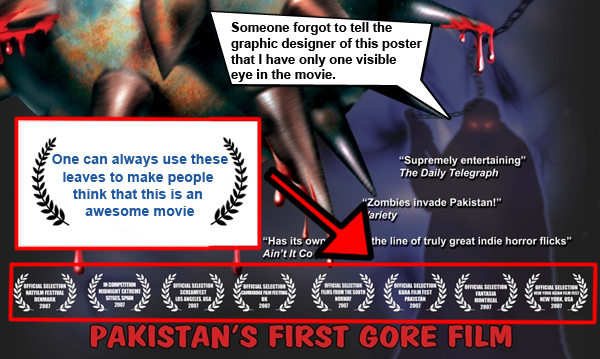 Zibahkhana is a zombie / gore / horror movie made/shot in Pakistan. Directed by Omar Ali Khan and produced by Pete Tombs. This movie surprised me with the amount of limelight it got in the media. It was mentioned in Time Magazine, The Telegraph and Variety. I was also surprised to see that it got 100% (7.2 out of 10) from rotten tomatoes. Even more than ImDB (5.5 out of 10). So I made plenty of calls to obtain a DVD with bonus features if possible. I was sucessful and started watching the movie. By the end I was immensely disappointed. It looked more like a film for assignment submission for a course whose teacher marked everyone as a winner. So because of this disappointment, this movie gets a very special review, spoilers and all. I give it 1 out of 10. It gets 1 for the concept of Burqaman. It loses all the other points because of low production quality, flaws in the script, substandard acting and a director with no eye for details. 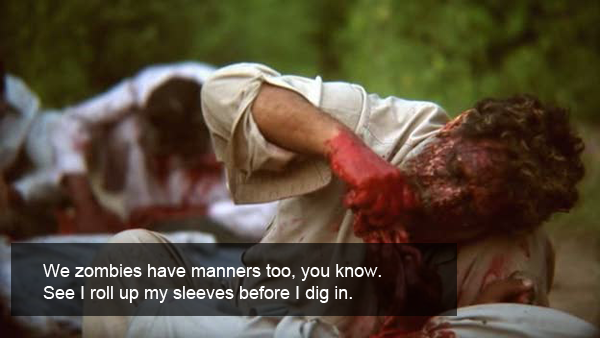 The best scene in the movie is that of a stream filled with trash and filth. At least the stream made an impact. From the start you have to stomach a lot before you get into the mood of watching this movie. It is sub standard from the get-go. From the poster (which was probably updated 3 times over the years) with crappy fonts (to scare us, I think) to the introductory scene that adds no horror value to the movie. i.e. A car gets into an accident because it hit something, we don’t know what. The actor sits up immediately, no shock, no trauma, and lights a cigarette. Great. There is a full shot of the actor and we see him getting scared of what appears to be thin air. Poor acting at that. takes a shortcut. Then there are no signals on the cellphone and they realize the gas gauge is messed up. Then the engine doesn’t start, and then the car gets stuck in mud (twice), there was mud but no source (rain/stream) shown. Actor asks whether the map has gas stations, as if it was Google maps — in 2008 — in print form — in Pakistan. 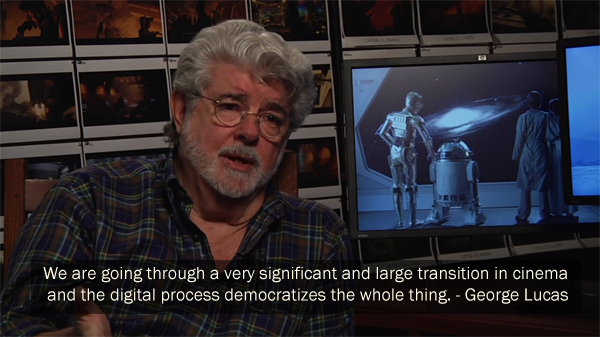 Some form of realism is important for us to help us connect with the movie. So that we get lost in the movie and are on the edge of our seats when the action quickens its pace. than the person attacked and possibly bleeding to death. start politely discussing philosophy as if they don’t even care what happens to him. – A stranger tells them he will guide them and gets into their van. Result: No reaction. They don’t stop the car or kick him out. – A decapitated human head lies in the van. Three of their friends are missing. And then out of nowhere a romance blossoms between the poor Christian boy and the upper-class religious Muslim girl. Huh? backgrounds but is inconsistent with the parts played by the actors. The music and sound of the car engine is turned on and off abruptly. There is no consistency. The dubbing was crappy overall. In one scene the mouth of the actor moves and words don’t come out. (very close by and at a height of 12 feet) masquerading as the moon. We’re not idiots. We can easily differentiate both. There is no consideration for day time and night time while shooting. In one scene it’s noon, then it’s sunset, and then noon and then sunset. 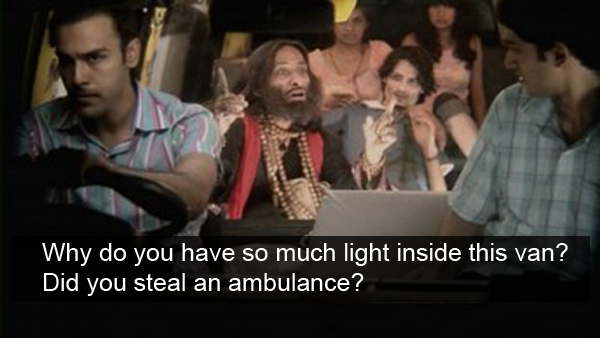 Tube-lights were installed in the van as if it were an ambulance. More importantly, lights in the van are on while they are escaping at night, lights are off in the van when they stop to check the front of the car. There is inconsistent lighting throughout the movie. They try to show a moonlit night. Sometimes too dark, sometimes we get the feeling of a street lamp in the middle of the jungle. Near the end, when we have established that there is enough moon light for people to walk about but then in a certain twist the girl suddenly can’t see anything, in that light. 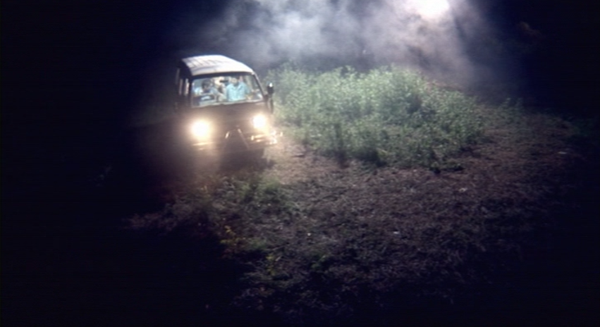 There is light all around the van, the girl does not notice the burkha-slasher, in front of the van, until she turns the headlights on. Totally believable. It was as if someone convinced their cousins to work with them on the project. Even striking/beating the car in anger is unconvincing. 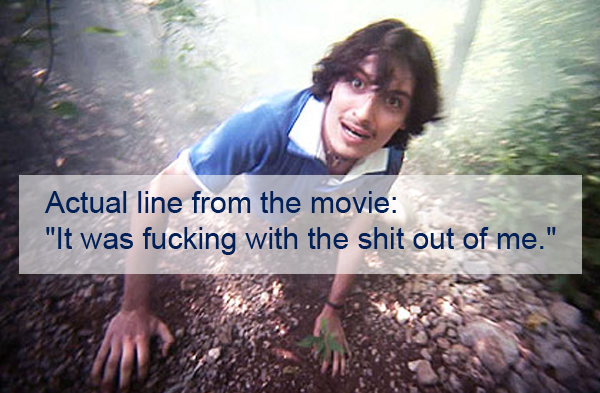 This is important because the movie is a zombie-slasher movie. Human parts will be eaten. Humans intestines look like chicken intestines. Make up isn’t consistent with the disease plot they were pursuing. Some have boils and white scales, some are normal with a zombie look in the eyes. This movie could get the razzie for the worst and unconvincing ‘horror props’ e.g. the scary stuff hanging from trees include a dead crow, a brand new doll not a rag doll and a foot of a chicken. hell do you procure candles in the jungle? 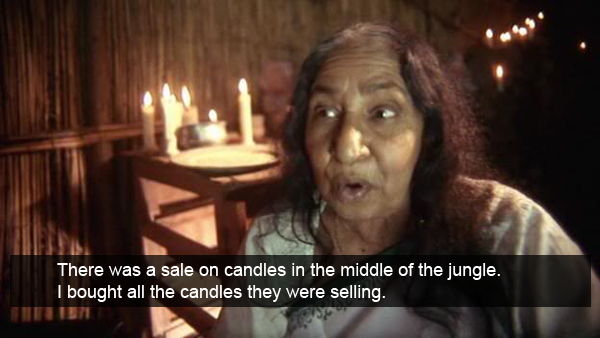 It appears there is a shop in the middle of the jungle that gives out free candles and people burn them generously. When one candle will suffice for lighting they still burn seven candles in more than one scene. The burkha-slasher uses a flail to smash the head of one of the ‘teenagers’. His head doesn’t even shake/move when the death blow is served. And his eyes (appear to) roll back into their sockets. After she strikes the slasher, she checks, to see if he is dead, in a very interesting way. Usually in movies we kick to see something (which was out to kill us) is alive or not. (as if he was her loved one) and listens to the heart beat. 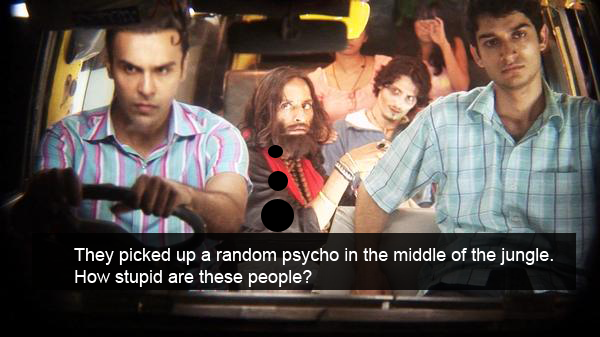 This movie should be shown in film institutes for a different reason. Take a guess how this movie ended. 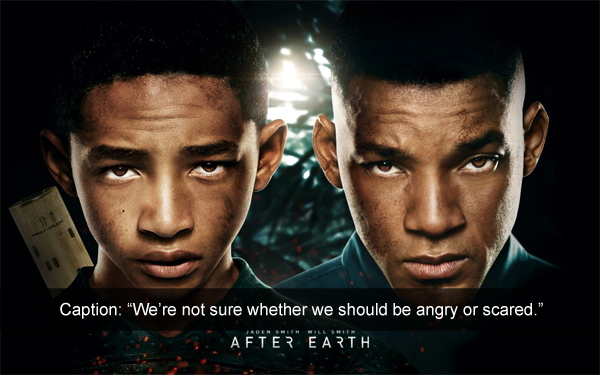 After Earth is a science fiction movie directed by M. Night Shyamalan, starring Jaden Smith and Will Smith. Set in the future, where humans have left Earth and settled on some other planet. A father takes his son on a military mission and they crash land on Earth. The son defeats/kills the alien and saves the father’s life. I give it a 2/10. 2 for production quality and fear-smelling-alien concept. It loses all other points because the story wasn’t gripping enough. It was interesting in certain scenes but didn’t have a strong role for Will Smith, which is frankly why we watched the movie. I also think that the people who watched this movie might have felt cheated in the end. The script has flaws. I have never been a fan of story writers trying to jump through hoops to make a story possible. More discussions should have been done on the script. We see that there is a military spaceship, it gets messed up and we realize that there are no escape pods to save the humans. The ship just crash lands and kills most of the crew. We deserve better from the future. 1000 years later and emergency landing still kills people? People travel (the seating arrangement) like they are going to be dropped out in the jungle from a plane? What if they land on the planet with no suitable atmosphere to expose your hands and face. Like in the case of the planet (Earth) they landed on. No thermal suits. There are no guns (for immediate protection). All we see is that Jaden has a cutlass that is on his back. 1000 years later and we still prefer close combat with aliens that can smell you and your fear from a considerable distance. We see that the communicator gets damaged. We also see that the heart beat, bone structure etc. is transmitted but voice communication not possible. So the communication between the devices is one way? At the end of the movie, Will Smith is saved by his son Jaden. After the rescue, we see the medics helping Will Smith with his injuries. We know that both of the legs are broken but still Will Smith says stand me up. Why put pressure on your broken limbs? Why couldn’t you stand up during the whole movie? We weren’t the only people who were disappointed. Will Smith also expressed his disappointment on Jimmy Kimmel Live, talking about After Earth coming at number 3 on its first day at the Box Office. Resemblance: It’s amazing how Jaden Smith looks exactly like his father Will Smith in the movie. I wasn’t impressed with the movie, but I would like to add it to my DVD collection when it becomes available on DVD. — This post is not a movie review. You can read reviews of the movie here on IMDB and RT. This is a post where I mention why I’m not going to watch the above mentioned movie that will ‘run’ in Pakistan on August 23, 2013. I’m sure the movie will be a success here in Pakistan as it inspired India (and made crores of rupees at the Indian Box Office). I also don’t have any issues with it showing in Pakistan. I’m sure this success will translate into other Bollywood studios producing sport themed movies. I appreciate that Farhan worked really hard in becoming ‘Milkha’ for the movie (Even Milkha accepted that Farhan Akhtar looks like him). I also recognize that he has talent for acting. There is no doubt about that. However, the only reason why I’m not going to watch this movie is because of its lead actor: Farhan Akhtar. It’s his character in real life that I don’t appreciate. This dates back to an unfortunate event on 02-MAY-2013, where an Indian prisoner, ‘Sarabjit Singh‘, was killed by a fellow prisoner in a Pakistani jail. 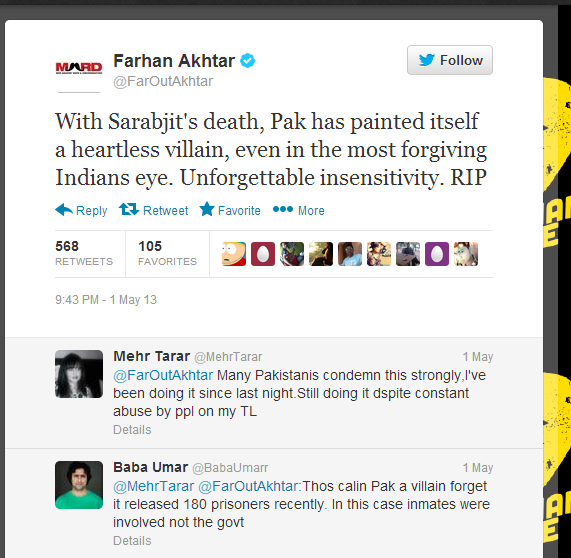 Farhan didn’t take into consideration the Pakistani lawyer that defended Sarabjit or the support given by the Pakistani civil society and media. Farhan didn’t even take into account the human rights activist, Ansar Burney, who helped bring back 6 Indian sailors that were held hostage (and these sailors were brought back on a Pakistan Navy warship PNS Zulfiqar). Farhan’s tweet showed the amount of research he did before he opened his mouth in public. This showed how irresponsible he is as an adult. He added fuel to the animosity that exists in different segments of Indian society. He acted like a troll. He misled hundreds of thousands of his followers. Shame on him. One way to look at Milkha, is that he is the best male athlete that India has ever produced and he won gold medals (Commonwealth & Asian Games) and prestigious awards like Padam Shri (1958) with an inspiring Cinderella story. at a truly international event (Olympics) and when his training required him to focus on the finish line. He failed miserably. When he was in the lead in the 400 meter event at the Rome Olympics 1960, he slowed down and looked back at the runners who were behind him. He lost his speed and thus lost his lead and came in fourth. I’m not emphasizing this because of any negativity. I’m adding this because Milkha, himself, considers this the biggest mistake in his life and the worst memory after his parents death. What we need to appreciate, is the work that went into making this movie, instead of focusing on praising Farhan Akhtar. We need to praise the director Rakeysh Omprakash Mehra, writer Prasoon Joshi, editor P.S. Bharathi and co-producers Viacom 18 for taking such a project and executing it well. That is the right way to acknowledge this movie. Just like Milkha’s son, professional golfer Jeev Milkha Singh did in an interview.